in the left corner, weighing in at 17.1 lbs., wearing absolutely nothing...halleeer! duh!?! haha she's obviously a newborn. it's Nadia...hehe I just came across this amazing photo and yes, she was a C Section baby! coz I'm pretty sure her mom won't even hesitate for a C section anyway..and I'm sure it's her only option! 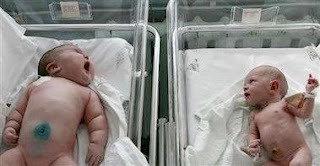 She's a 17pounder , a sumo baby (read: BIG! HUGE! OVER-SIZED! HEAVY?) I'm wondering if her mommy is diabetic like me..now I'm praying that my baby won't be so big or else... huwaaaah! :) hoh well... She sure is heavy and I'm wondering how big her mum was at the time she was pregnant but imagine someone seconds after giving birth and she has already lost 17 lbs.. wow! as for me, for the record, I lost 20 lbs. after 6 months! and before I forget, look at the baby in the right corner, it looks like it's saying, "Dang! This isn't a fair fight!" waaah!!! OMG! 17 pounds?! That baby is super huge!